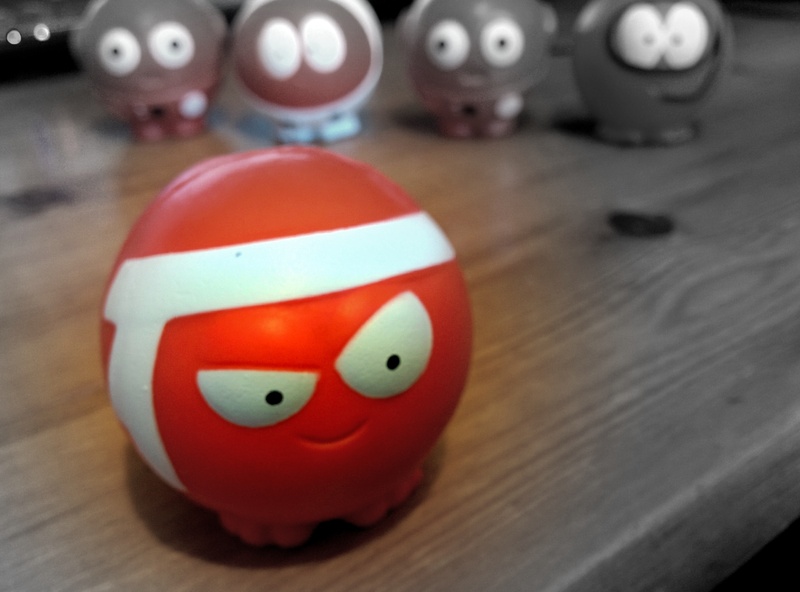 Yesterday was, of course, Red Nose Day! At the time of writing this post, their website says £78,082,988! Incredible. We couldn’t let this day go by without some form of recognition and so, while I was sitting at work thoughtfully squidging my friend Snortel the red nose, I had an idea for a rather enjoyable drill we could mark the occasion with: Red Nose matches! So, after a few shuttle runs, shoving each other around and shoulder mobility exercise, we got to it: in pairs, everyone has a red nose on. As a test of your parrying and blocking, you have to knock each other’s red nose off! No point-keeping or anything; just a bit of fun to warm up with. We used this however to make a very useful point. If you keep your attacker at range 3 (about an arm’s length away) and you’re trying to control them like that, good luck. I say that because it’s incredibly difficult to protect yourself successfully while you’re there, as you usually get into a kind of standoff where you’re reacting to their strikes, throwing some of your own, and you’re too easily overwhelmable. You have to be extremely skilled to manage to parry and/or block an unrelenting attack keeping someone at that distance. However, as we were saying the week before last, fear (or inefficient training) can lead to mis-management of this distance between yourself and the person trying to assault you. As we found with this lighthearted drill, it was much more efficient to move in to range 1-2 and control the limbs of the attacker much more closely, restricting their movement and ‘jamming’ their attempts to strike. Yet again, you’re going to be sick of me going on about this, but posture is everything in takedowns too! 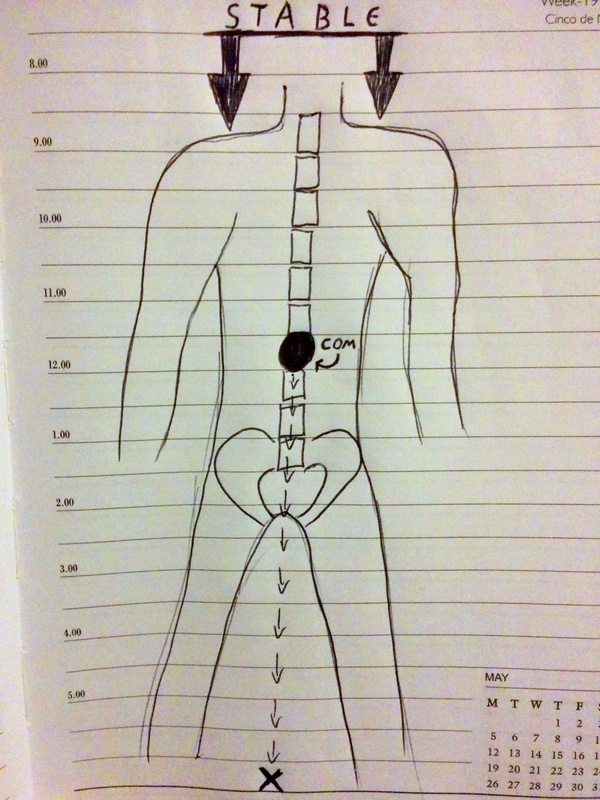 We looked at a couple of concepts: spine alignment and the position of our Centre of Mass (COM). However, if the spine is misaligned, things are different. Whether it’s a sideways bend (as the right-hand scribble on an old diary’s page attempts to portray) or a move forwards or backwards, this misalignment shifts the COM away from that centre line. 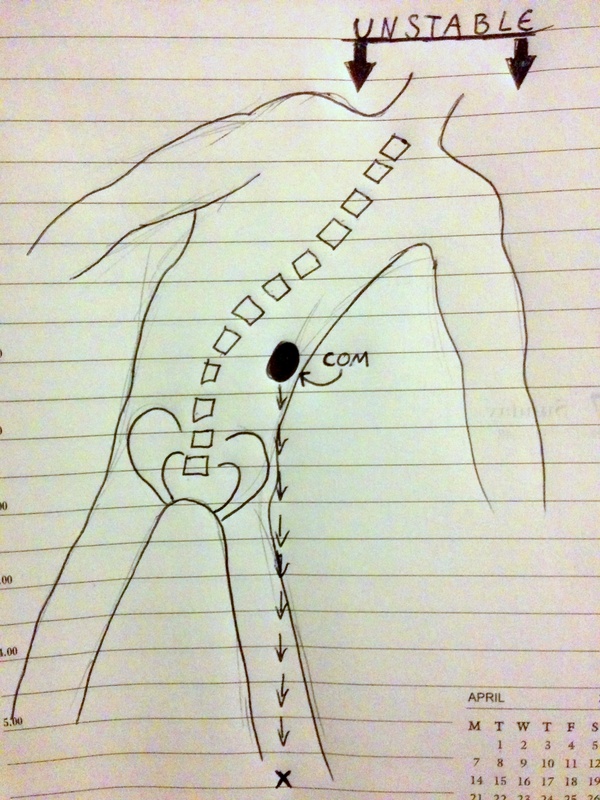 As the point on the floor directly below a person’s COM (reference point marked x on the above scribblings) is moved in any direction away from the centre, the posture of the person is weakened and their ability to withstand downwards pressure without falling to the floor is compromised. The person’s balance is off, and you can use that to your advantage! 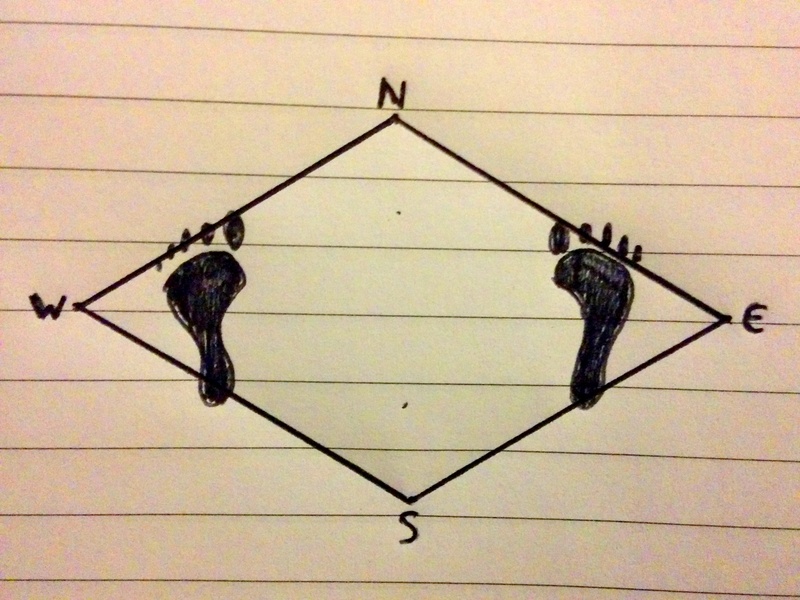 Think of it as moving that x towards one of the compass points to the right. Prevent their feet from taking the natural step they’ll want to take to recover from this and lo and behold: a takedown just happened! Of course there’s more to it than just this, and plenty that can be done besides, but this is a basic look at takedowns. This post was going to be just brief bullet points, but then I found I was in a typing-something-up mood! After violence occurs, you have to be able to explain what happened and justify why it did. We took a simple drill – Person A attacks Person B however they like, and Person B responds – such as you’d find in any self-protection or martial arts class. What we did then, however, marks out quality mindful self-protection training from those who pay lip-service to the Force Continuum and to justifying your Force Deployment after violence takes place. Person A then asks questions. Person B has to justify what they did – honestly, openly and mindfully. When we talk about justification, it’s important to remember that you’re not just justifying yourself legally. Socially, you might have to justify yourself to the people around you (family, friends, colleagues) who could see you as ‘violent’, or as someone who’s ‘been in a fight’. It’s now up to you to explain to them that it wasn’t a fight: you protected yourself and had to. Personally, you will likely have to justify it to yourself as well. Doubts could spring up about what you did and whether it was the right decision, whether you could have de-escalated better, etc. After the violence has ended, there can be a lot of mess to clear up before it’s all over! This underpins everything that we learn in an Evolutionary Self-Protection session. Never forget that you have to justify and understand what you’re doing. There’s a lot more to it than chucking your partner around and bashing the pads. Even a silly bit of fun – knocking red noses off each other – in a room full of laughter is a valuable learning and training experience with obvious progression and subtle nuances for beginners and experienced participants alike. Train mindfully. Train efficiently. Train evolution…arily? Yep, that’ll do! Have an awesome weekend everyone – see you next week! -Josh Nixon All the details of this class are on the Public Classes page up at the top. Your first session is FREE and all are welcome to come along and take part. Every session is beginner-friendly.